At AssociatesMD we specialize in Allergy Testing and treatment. According to the CDC, Allergies are the 6th leading cause of chronic illness in the U.S….More than 50 million Americans suffer from allergies each year. An allergy is a reaction by your immune system to substances including pollen or food. 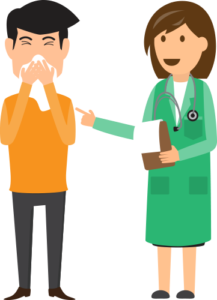 If you have symptoms of runny nose, itchy eyes, sneezing, or watery eyes you may have an allergy. AssociatesMD Urgent care can treat your symptoms caused by seasonal allergies. From temporary relief, to allergy testing and immunotherapy & injections. Your treatments and testing can be covered by your insurance. At AssociatesMD we accept most major insurances. We are open 7 days a week, and no appointment is necessary. Come in and get tested for your allergies. You’ll feel better. Allergies can hinder everyday life. But rest assured there are viable and healthy solutions! At AssociatesMD we specialize in Allergy Testing and treatment. Our physicians and physician extenders have undergone extensive training and credentialing to assure our patients that they will get the highest quality primary care and service. We are highly trusted and are the leaders in providing care options. In regards to Allergy Testing & Treatment, here is some additional information on the procedures.